Starwood Hotels and Resorts, which announced its merger with Marriott International earlier this week, is slated to bring its Westin brand to Brisbane by 2018. According to The Australian Financial Review, the hotel will form part of Sam Chong's $325 million mixed-use high-rise development Mary Lane, at 111 Mary Street, Brisbane. 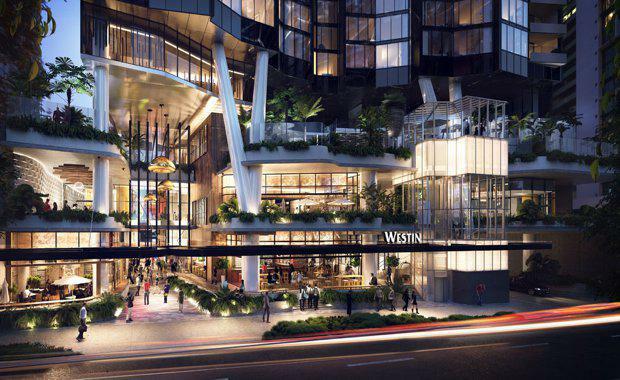 Mr Chong, who owns and developed the Four Points by Sheraton Brisbane, told the AFR, "We look forward to working with Starwood on this development project and the debut of Westin in Queensland. The Westin will feature 286 guest rooms with river and city views, resort style pool, bars, fitness studio and Heavenly Spa. There will also be a reported 667sqm of meeting and event space available. Regional vice-president at Starwood Hotels and Resorts Sean Hunt told The AFR, "It will give us a Westin hotel in all major capital cities. ""The Westin hotels are market leaders in Sydney and Melbourne, with highest combination of occupancies and room rates," he said. Once open, it will be the fourth Westin operating in Australia, with the Westin Perth due to open in 2017.